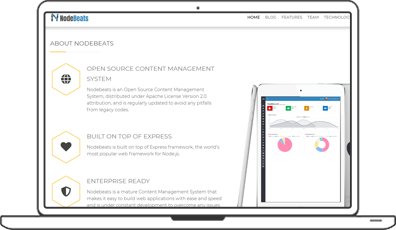 Nodebeats is an Open Source Content Management System built on MEAN Stack framework. We have developed this CMS with an objective to serve the global tech community. As BitsBeat always believes in “giving back” philosophy, Nodebeats is what we have given back to the technology world that made us what we are today. Using Nodebeats CMS the developers can build simple to advanced applications as per technology need. With the latest release of version 3.0, it has been upgraded to angular 5.0 and all the latest packages. More than 50+ website are already relying on Nodebeats and also, the global community is flourishing. Bitsbeat is planning for the major release on June 4, 2018.